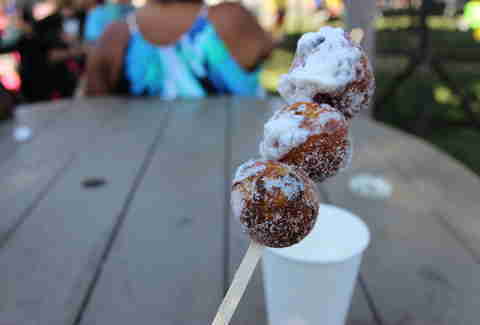 It’s July, which means the Orange County Fair (July 17-Aug 16!) is back to celebrate its 125th birthday. This summer the theme is, “Think of a thing! 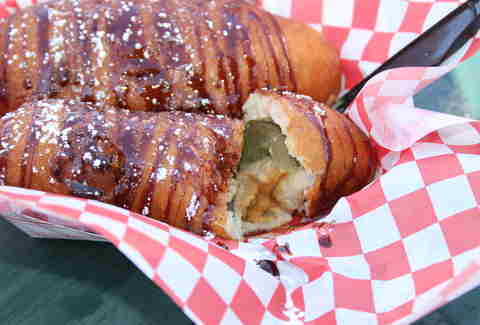 We’ll deep-fry it!” So, obviously, we hit the fairgrounds to check out all the insane new fair foods. 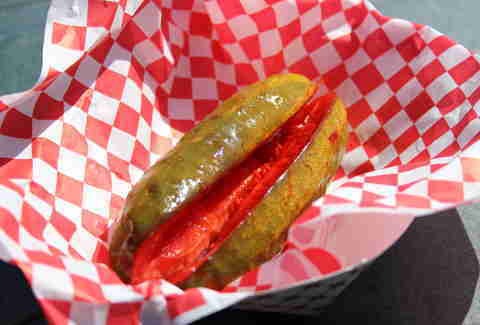 Here are the 12 craziest (mostly fried-iest) offerings. Pickle O’ Pete’s was all like, “Ya know what goes good with Kool-Aid? Pickles!” It's sort of right. These pickles have been sitting in Kool-Aid all night, and thus, they taste like Kool-Aid. 2015 is crazy. Too tired to even take a sip of your coffee? 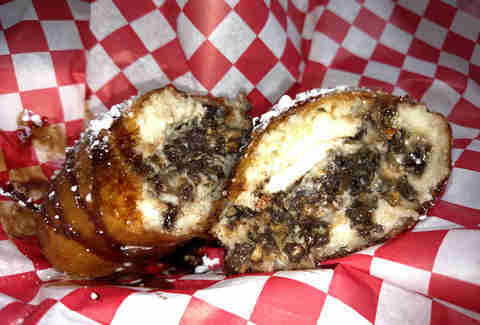 Bacon-A-Fair has you covered with DEEP-FRIED COFFEE, which is stuffed inside of a DONUT BALL. Yes, this is real. And since they’re not savages, they’ve dusted it with sugar and topped it with whipped cream. 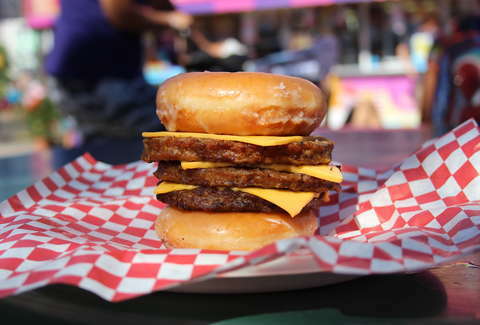 Remember that Jim Gaffigan bit where he said that one day they’d be serving hamburgers between donuts? 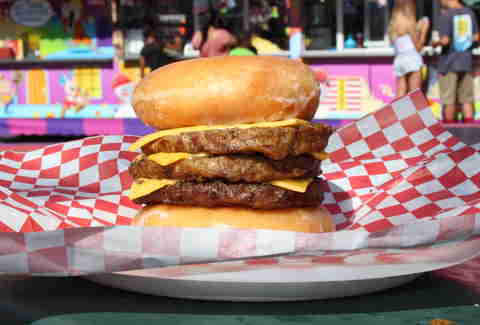 Well OhMyGoshOhMyGoshOhMyGoshThankGod Gaff was right, on account of the fact that Chicken Charlie’s is now serving hamburgers between donuts. 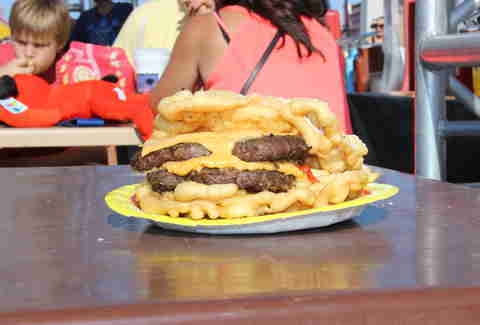 With three patties and three slices of cheese, obviously. I think we can all agree that spicy sausage bites require a lot more bacon, wasabi, and deep-fried-itude. 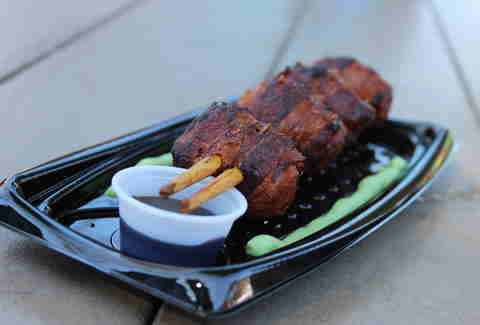 So Bacon-A-Fair is giving it to them, and impaling them with chopsticks. Bacon be praised! We were all thinking it. 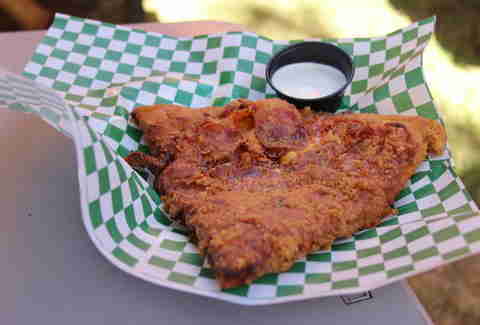 Apple Fries went ahead and did it, ‘cause they took a slice of pepperoni pizza, dipped it in a zesty beer batter, deep-fried it, and served it with a side of ranch dressing. America is so great. 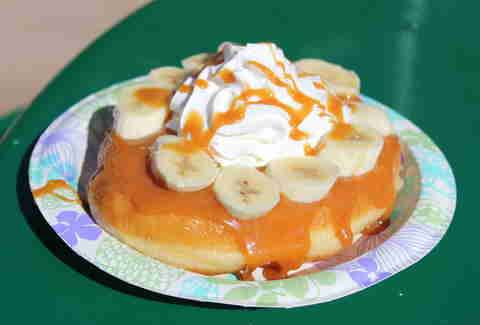 This monstrous ‘nut is topped with bananas and whipped cream, and then caramel infused with Fireball whiskey. The elegant snack of the new millennium. Oh, also, IT’S AMAZING. 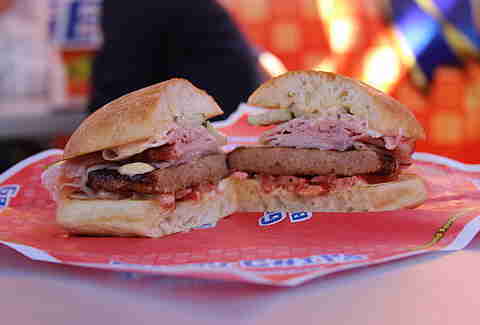 Pork sausage burger patty! Smoked ham! Tomato! Sliced pickles! Spicy mayo! Mustard! Swiss cheese! Ciabatta! Congratulations, you’ve reached nirvana! Is it your birthday? Who cares, they’re deep-frying the cake! 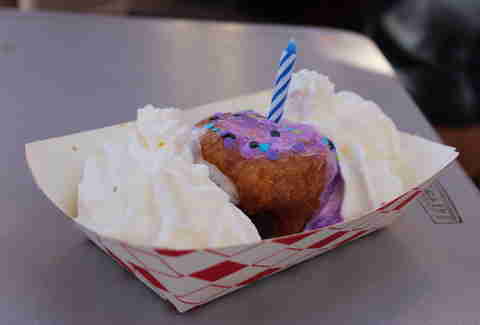 The cake is bathed in a sweet batter, deep-fried, and topped with homemade whipped cream and sprinkles. And it comes with a candle, of course. Seems as though Juicys got tired of not sticking a cheeseburger between its funnel cakes, because that’s exactly what it's doing this year. It’s covered in powdered sugar, and we all know that powdered sugar makes everything better. Even hamburger meat. Twinkies too plain and casual for you? 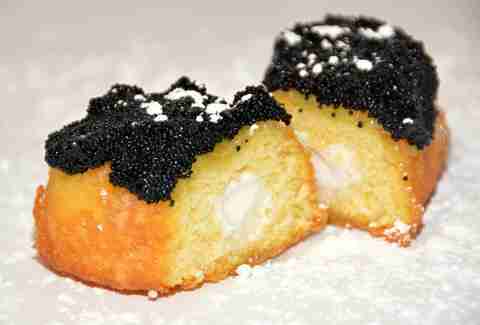 Not this year they’re not, ‘cause Chicken Charlie’s is topping its Twinkies with delectable caviar. And the best part? This incredible creation will only run you a cool $125. ‘Cause you’re on a diet. Wilder Shaw is a regular Thrillist contributor who is shocked he didn’t suffer several hundred heart attacks for this story. Tell him to get some exercise on Twitter at @WilderShaw_ and Instagram at @wildershaw.